Craig Levein says the Hearts fans in his team can help end their miserable recent Edinburgh derby record. The Tynecastle outfit face Hibernian in the Premiership on Tuesday, having failed to win any of their past seven meetings with their city rivals. "We have the benefit of having some Hearts-minded people in the team, which I think helps," Levein said. "There are players in there who understand the game, understand what's required." Levein, who replaced Ian Cathro earlier this season, is looking to the likes of Christophe Berra and Jamie Walker to impress upon their team-mates the importance of winning at Easter Road. "They will be able to let the rest of the players know just how important this is," said Levein, who takes charge of Hearts in an Edinburgh derby for the first time since 2004 during his first spell as Tynecastle boss. "Our last few derbies haven't been particularly good. It's been painful to watch at times. "I can probably count on one hand the amount of really good games there has been. But that's not what it's about, it's about winning. Our thoughts are about winning this fixture. "It might mean there's a lot of challenges to be won, a lot of second balls to be won, but if we're going to win the match we need to do that." The Hibs fans are likely to give Kyle Lafferty a hot reception at Easter Road after his decision to knock back a move to Neil Lennon's side in favour of a move to Hearts in the summer. 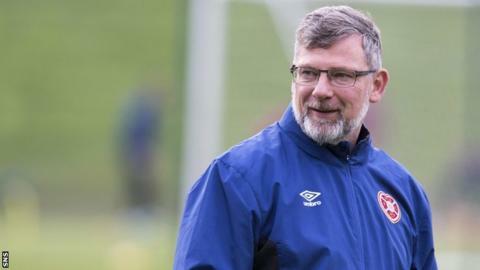 Levein believes the Northern Ireland striker "will relish" that sort of hostile atmosphere, and says the addition of several big characters to the team, including Lafferty, has made Hearts a tougher proposition. Hibs have made a strong start to the season on their return to the Premiership, and Levein has been impressed by the work done by Lennon across the city. "I think Neil has done a fantastic job," Levein added. "The biggest thing of course was getting promotion to get out of the Championship because they've had some good managers previously who haven't managed to do that. So that's a big tick in his CV. "Since then they've improved and I don't think you can do much else as a manager as get a team promoted and then be in the top six. "I've always thought that going to Easter Road is a difficult thing to do. This game in itself brings different feelings and emotions to the players and to the coaches and supporters. "Sometimes people can be overawed by the occasion. I'm hoping we don't have any players on the pitch who feel that way."